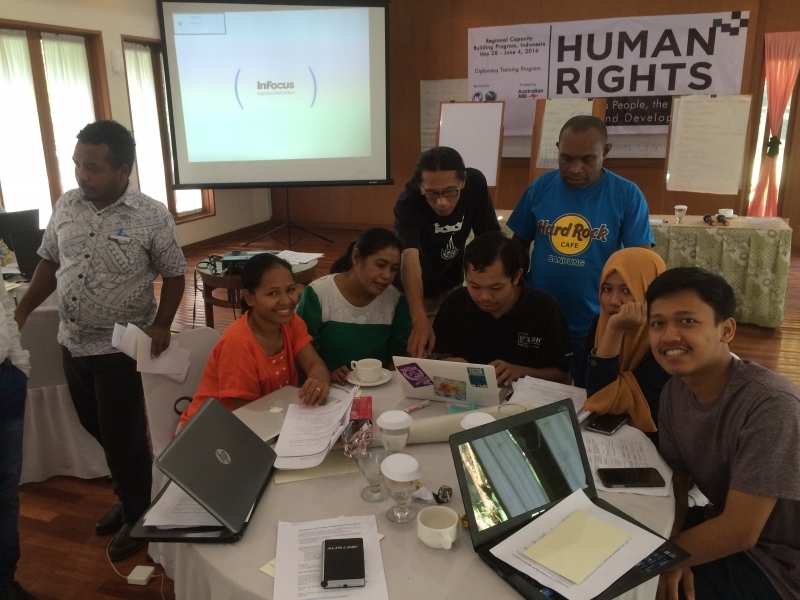 From May 28 – June 04 2016, DTP held a regional capacity building program on Human Rights, Indigenous Peoples, the Private Sector and Development in Indonesia. 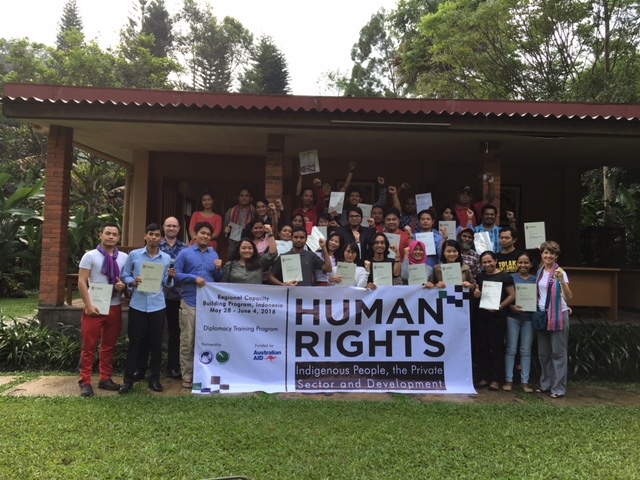 This program brought together two of DTP’s priority themes – human rights and business and the rights of Indigenous peoples and 33 participants from 11 countries. It was organised in partnership with ELSAM Indonesia (http://elsam.or.id/en/). Facilitators included Brynn O’Brien (Australia Institute) and Matthew Coghlan (Singapore based lawyer/consultant) and Jannie Lasimbang (JOAS and former human rights commissioner, Malaysia). Business and human rights is central to the research and advocacy work of ELSAM and they were well positioned to recommend and invite a number of excellent resource people. The program was opened by Marzuki Darusman, the UN Special Rapporteur on North Korea and former Human Rights Commissioner with KomnasHAM. Forced displacement, loss of livelihood and environmental destruction were common themes in cases studies raised by participants – including a major dam on the Salween River in Myanmar, the Kaiduan dam in Sabah and palm oil plantations and pulp and paper mills in Sumatra and Papua – and the huge development of a sea wall and land reclamation in Jakarta. A number of the very good participant presentations focussed on the negative impact of palm oil plantations – on communities, livelihoods and the environment. The clearing of rainforest for palm oil is one of the key causal factors in the annual forest fires that swathe significant parts of Indonesia, Singapore and Malaysia in a smoke haze for many weeks each year. The scale of the destruction of rainforest is truly alarming – above and beyond its impact on the Indigenous peoples and communities losing their land, livelihoods and way of life. On the ground in the region there is little distinction drawn between struggles for the environment and for human rights. Destruction of the environment is seen through a lens of impacting on communities and livelihoods. The human rights of environmental defenders are front and centre of concern – protesting mining, illegal logging, dams and other developments is done at great personal risk. This program was very well evaluated and plans are being made for further regional collaboration (Indonesia and Malaysia) to provide similar training for youth and women.